Industrial electric boiler with electronic control panel and external temperature compensation. Without pump and expansion vessel. 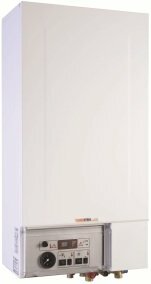 Termo Blok PTV is 100% energy efficient electric boiler for central heating and domestic hot water preparation in separate cylinder available with wide power range (6 kW up to 40 kW). Boiler is equipped with all necessary working and safety components that allow easy usage with high reliability. Automatic deaeration system and low voltage system gives even more reliability. Termo Blok is 100% energy efficient electric boiler for central heating available with wide power range (4.5 kW up to 40 kW). Boiler is equipped with all necessary working and safety components that allow easy usage with high reliability. 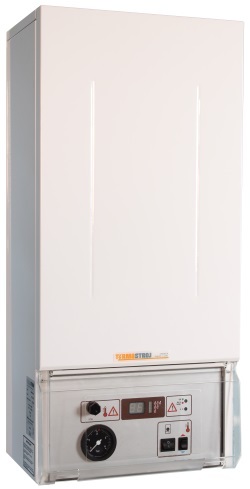 Termo Mini is 100% energy efficient compact electric boiler for central heating. Boiler is equipped with all necessary working and safety components that allow easy usage with high reliability. Termo Extra is 100% energy efficient electric boiler for central heating available with wide power range (4.5 kW up to 96 kW). Termo Extra boiler is suitable as reserve or parallel source of heating in central heating system, but it can be used as independent heating source also. Termo Extra boilers are not equipped with pump nor expansion vessel. Termo Kombi is 100% energy efficient electric boiler for central heating and rapid water heating available with wide power range (18 kW up to 40 kW).